A seafood [mariscos] stew, common in coastal cuisine of Galicia, also in other areas of the Spanish coast. Common ingredients: include crab, velvet crab, barnacles, shrimp, and lobster. 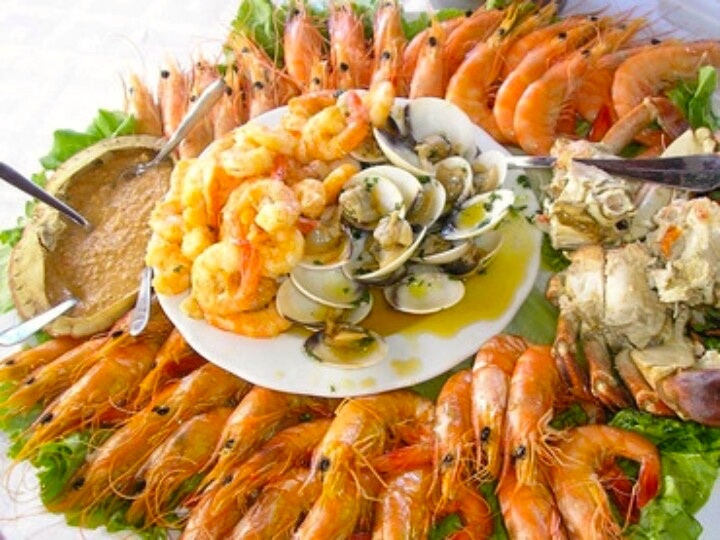 Mariscada is an Atlantic Seafood inspiration based on rice and very popular along coastal Portugal. The dish often has lobster, shrimp, clams, mussels, as well as cuttlefish and is seasoned with olive oil, sea salt, pepper and Portuguese paprika. If you’re in Spain, it’s Spanish; if you’re in Portugal, it’s Portuguese. Surely it’s another dish in the family of seafood stews prepared in fishing communities along the Atlantic and Mediterranean coasts (more on this below), and it would be fruitless to try to pin down its ultimate source. Meanwhile, from Spain and Portugal the dish (in several variants) made its way to Latin America, notably to Brazil, Mexico, and El Salvador. And sometimes it’s clearly made as a seafood-rice stew. And sometime it’s frankly prepared (and labeled) as a soup. 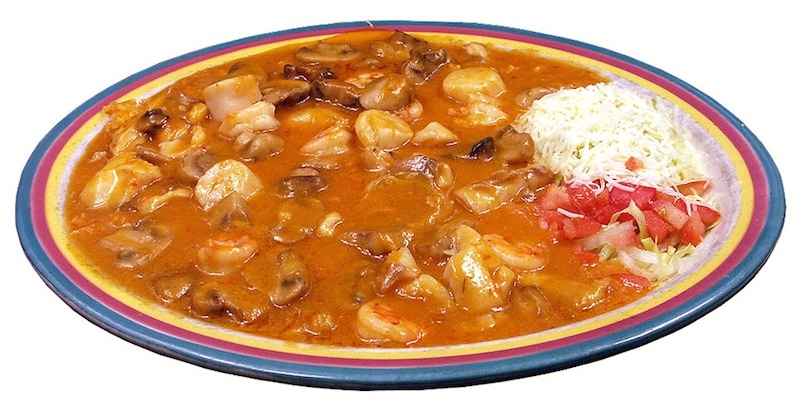 Yesterday’s lunch special at the Mexican restaurant Reposado was billed as cioppino, though it was recognizably a Mexican-style sopa de mariscos ‘seafood soup’. Meanwhile, cioppino is standardly described as a fish stew (as in the Wikipedia article on the dish), though it too is a seafood soup, essentially a clear tomato soup with a whole lot of seafood (including fish) in it. … Cioppino is a San Francisco dish (so it’s no surprise that sopa de mariscos would be billed as cioppino in a Bay Area restaurant), but its roots lie in Italy; the sopas / estofados / caldos de mariscos of Latin America, Mexico included, have their roots in Spain; so both originate in the fish soups and stews of the maritime Mediterranean, from Greece and Italy to France and Spain, which vary locally but share a family resemblance. This entry was posted on January 31, 2016 at 9:15 am and is filed under Language and food. You can follow any responses to this entry through the RSS 2.0 feed. You can leave a response, or trackback from your own site.